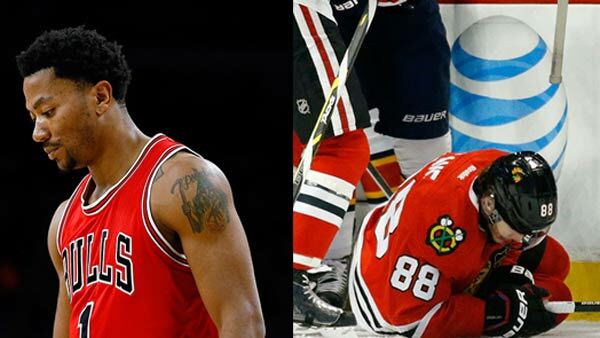 Derrick Rose of the Chicago Bulls and Patrick Kane of the Chicago Blackhawks. CHICAGO (WLS) -- In the span of just a couple of hours, the championship fortunes of Chicago's two winter-spring franchises crashed into the boards of the United Center as the Bulls' Derrick Rose and the Blackhawks' Patrick Kane both suffered injuries with unknown timelines for return. For Rose, this will be his third knee surgery. He may have injured the meniscus in his right knee in the third quarter of Monday's win over Milwaukee. "We don't know exactly when it happened other than when he went to get the MRI after practice yesterday, so for us, first and foremost, it's our concern for Derrick - not only as a basketball player but as a person," said Bulls Coach Tom Thibodeau. "He's been through a lot, he's had to endure a lot and he's gotten past a lot. So it's disappointing news and we're hopeful that everything will work out fine." The second blow to Chicago sports came in the first period of Tuesday night's Blackhawks-Panthers game at the United Center. When Kane was cross-checked by Alex Petrovic, he slammed hard into the boards, fracturing his left clavicle. He left the game and did not return, but underwent a successful surgery Wednesday and is anticipated to make a full recovery in 12 weeks, officials said. "You've got the highest scorer in the game on our team so he's certainly a very valuable asset that makes a lot of things work for us - you're missing a valuable guy, buddy - he's having one of those year's that's very noticeable, but the guy's still gotta stick with it and go with what you got," said Blackhawks Coach Joel Quenneville. For Rose, the outlook is bleaker. If he decides on his long-term health and has the same meniscus surgery he had in November 2013, then he's done until next year and the Bulls title hopes this year are on life support. If he has the same surgery Dwayne Wade had, where they remove the meniscus, he could be back by the playoffs; but his life after basketball will be plagued by arthritis. Rose was hitting his stride, his explosive play making Bulls fans feel like they could breathe easier - but they've had the wind knocked out of the again with news of his injury. "I think his career is up for grabs. He may not be here next year," said Derrick Harper, a fan. With Rose being sidelined again for an undetermined amount of time, his future with the Bulls was the hot topic of discussion at the Palace Grill. "They should be starting to look at future, bring talent in," said Roy Quitshaw, a fan. Dr. Mark Bowen, an orthopedic surgeon, says Rose's recovery time depends on how the knee injury is repaired. "It may be that it just needs a clean-up and some reoval. It's possible they may try to re-repair it," Bowen said. The latter meaning a longer time off the court, a double whammy when coupled with Kane's injury. "To have two teams affected like that is unprecedented," said Nick Friedell, ESPN.